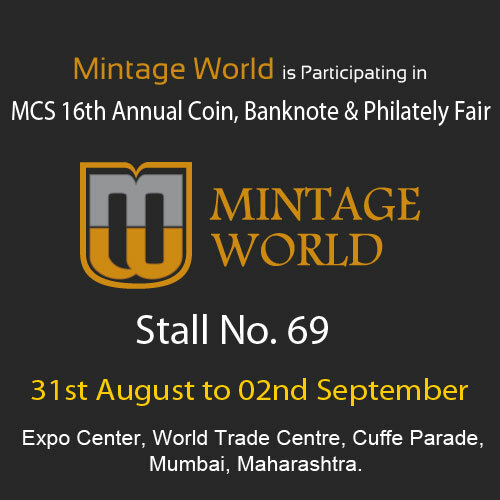 Mintage World is proud to announce that we are participating in MCS 16th Annual Coin, Banknote & Philately Fair 2018 taking place today in Mumbai. It is held from 31st August to 2nd September in The Expo Center, World Trade Centre, Cuffe Parade from 9 am to 7 pm. This event is organised by Mumbai Coin Society. Many dealers across the country are participating in this exhibition. On 31st August and 1st September Todywalla is commencing its Budget Auction No: 9 and Auction No: 118. There is one more auction No 74 held by Oswal Antiques on 1st September starting from 2.30 onwards. Mintage world will be waiting for you all with our excellent products and also flat 20% off on all products. So don’t miss out on this chance.